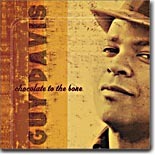 Guy Davis is one of the better of the newer generation of young black blues singers / guitarists performing in a traditional blues format. Unlike many of his counterparts, Davis has yet to move on to one of the major blues labels, instead preferring to remain with tiny Red House Records, based in Minneapolis. It's been a good marriage between Davis and Red House. Chocolate to the Bone is his sixth disc for the label, and it's one of his best. The general theme of Chocolate to the Bone is based around traveling and riding the rails. Thus, it's a little more of a "feel good" disc and less foreboding than previous Davis albums. Davis opens the album with a variation of Sleepy John Estes' "Brownsville tune, here titled "Limetown." He plays the clawhammer banjo and blows mean harmonica, giving the song a real Terry-McGhee feeling, even to the point of adding a few Sonny Terry-style whoops. "Shortnin' Bread," again featuring Davis on banjo, has a more urgent tempo and includes more whoopin' during the choruses. The traditional "Step It Up And Go" is given a distinctive sound with the addition of tuba from Howard Johnson (do you all remember him from his work with The Band?). Davis plays 12-string guitar, and makes this raucous country frolic tune his own. "Right On Time" is an original composition, dedicated by Davis to Furry Lewis. This is a classic train song; it's easy to imagine folk singer Utah Phillips, the master of traditional railroad music, doing this number. Davis takes a darker turn on "Set a Place For Me," on which he borrows the chromatic harmonica licks from the classic "Summertime." The addition of organ accompaniment and some electric blues guitar chords gives this song a more urban sound than the other numbers here. Also breaking the mold is his version of Charles Brown's "Drifting Blues," turned here into an acoustic guitar and harmonica showcase, yet still retaining a little more of an uptown feeling, especially when Davis switches over to electric guitar. "Honey Babe" is Davis' country blues ode to the his favorite type of woman, singing "...She's a big hip mama, chocolate to the bone, coming to meet the train I'm on..." and "...A city gal got city ways, a country gal got love that stays..." Those two lines say it all. Davis takes Willie Dixon's "Back Door Man," slows it down and gives it a deeper sound than the original version done by either Dixon or Howlin' Wolf. You have to listen carefully, but you'll again hear Johnson's subtle tuba accompaniment here. "Railroad Story" demonstrates Davis' prowess on the harmonica, getting his harp to make all of the appropriate train noises, plus giving it more of the Sonny Terry whoops as well as telling a variety of folk tales throughout the four plus minute song. Chocolate to the Bone is a refreshing album featuring the talents of a performer that really should be better known in blues circles.